How will this university be organized? As in the great Earthside research centers, there will be permanent and senior faculty as well as a number of people on temporary appointments. The permanent positions will belong to those scientists who will have been involved from the start in establishing the university. However, if they are like senior scientists in the Earth’s research centers, they will spend little time in the laboratories or at the telescopes. Instead, they will be attending meetings with senior colony administrators or going to Earth to testify before Congressional committees or meeting with wealthy donors to seek funds. The real work of the University will be in the hands of the junior faculty or the researchers there on temporary fellowships. 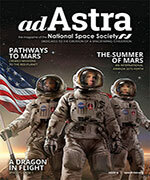 These will be eagerly sought by Earth’s best graduate students and young researchers. Some of these people will so distinguish themselves that they will be invited to stay, to join the growing faculty permanently. But when they first arrive, like junior researchers everywhere, they will find themselves sharing cluttered offices and labs. Zero g will also provide the opportunity for a lot of work in the general area of materials and chemical processes, some of which may lead to new industrial ventures which will return a tidy profit. For instance, very large crystals can be grown of the type needed by the electronics industry. You can purify molten materials by a technique known as “zone refining,” which works best without gravity. Many people have noted the possibility of producing perfectly round ball bearings by allowing molten metal droplets to form spheres under their surface tension, then to solidify. There is a process called “electrophoresis” in which you can separate materials in solution by having their molecules migrate under an electric field, applied across the container. It is useful for purifying vaccines and other pharmaceuticals, and it works best in zero g. Finally there is the ability to mix materials in the liquid state which would ordinarily separate, like oil and water. Foam steel (like foam rubber), alloys such as iron-lead with unusual electronic properties, composite materials—all can be made in zero g.
These are some of the immediate possibilities. 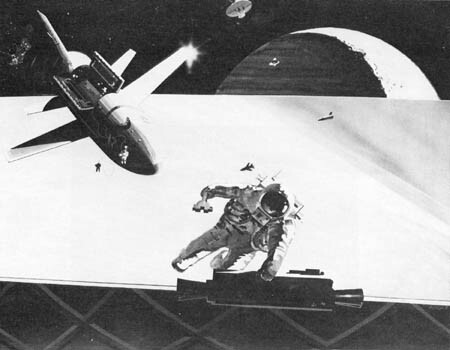 In the long run, the work of the zero-g lab may produce advances in science of the highest importance. Our present highly limited experiences with zero g may fail even to hint at the discoveries to be made. We are so pervaded by gravity, we find it so hard to escape its effects, that in thinking today of the prospects of zero g, we can only be like fish living in the sea, wondering at the possible uses of fire. We may gain a hint as to the future importance of zero g by comparing our situation now to what happened three centuries ago, when it became possible to remove another pervasive force—air pressure. The ability to make a vacuum led to the steam engine and to other engines and to many of the inventions and developments of the nineteenth century. But the ability to make a vacuum did even more. In the last years of the last century and the early years of this century, physicists were astounded by a variety of new phenomena. There were electrons, ions, X rays, atomic structure, radioactivity and much more. And what lay behind many of these discoveries? It was the humble vacuum pump, finally improved to the point where it could produce vacuums sufficiently good to allow electrons and ions to show their true behavior. Not only did these discoveries spark the development of much of modern physics; they also led, early on, to the vacuum tube, radio, and the whole of modern electronics. If someone had asked Torricelli, the inventor of the vacuum pump in 1650, what his invention was good for and if he had answered, “It opens the age of engines, electronics, and nuclear physics,” no one would have understood or believed him. 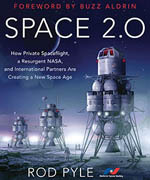 We cannot now imagine what zero g will mean to the people or the scientist of the year 2300—or even 2100. In zero g materials in the liquid state become objects in their own right. They can be studied and heated or treated without a container, or held in place with small forces. This means it will be easy to study highly corrosive materials or materials of very high melting point. They can be produced and studied in very pure states, since there will be no danger of their dissolving any material from a container. On Earth, liquids can almost never be studied entirely apart from the containers which hold them. Thus, physicists have been unable to develop a satisfactory understanding of the liquid state to match their knowledge of the solid state. In zero g, where the most subtle effects of the liquid state can be observed, all this will change. Solid-state physics has given us much of our present-day electronics. What may we gain from liquid-state physics? And the unprecedented control over materials, their purity, their mixture with each other, their composition, may well herald an era when we will routinely create metal-glass mixtures or plastic-ceramic alloys with virtually any properties desired. There is an immense range of properties available from the products of today’s plastics industry. This may be only a taste of the range of properties available from the zero-g industries which, like the electronics firms near MIT, may grow up around the colony’s laboratories. We may obtain superconductivity at room temperature. A superconductive material has zero electrical resistance so that it can carry immense flows of current, or give rise to huge magnetic fields. But at present this highly prized property can only be achieved at very low temperatures, such as the temperature of liquid helium. The development of a room-temperature superconductor would completely transform transportation and could make the wheel nearly obsolete. Cars and trucks, instead of being supported by tires, would have small, powerful superconducting magnets. Their “roadways” or guideways would be of aluminum and, when traveling faster than ten or twenty miles per hour, the magnets would support them precisely as the buckets on the mass-driver will be supported. Beyond this, our terrestrial ideas of the possible practical size of processing equipment and facilities may need adjustment. The disappearance of dead weight in machinery will allow us to build tools of truly extraterrestrial dimensions, perhaps capable of using even cosmic phenomena as production means. But zero g is only one of the phenomena which will lure scientists to the colony. Another one is the entire surrounding sky, visible with unprecedented clarity. It is certain that the colony will quickly become a leading center for astronomy. Since the 1950s, the development of new instruments and techniques has wrought a revolution in astronomy. The discovery of quasars, pulsars, black holes, and the background radiation from the birth of the universe, has pushed astronomy again to the position it held in the time of Newton: at the forefront of the physical sciences, and among the studies promising the most important new insights into nature. The past twenty years have seen major new additions to the facilities at existing observatories, such as Mount Palomar. Whole new observatories have been built, as at Kitt Peak and Cerro Tololo. Radio astronomers have built their immense receivers, shadowing acres of ground in California and West Virginia, Australia and Puerto Rico. The history of astronomy is a history of efforts to overcome three types of limits upon the ability to observe objects in space. The first is the limit set by the dimness of these objects. To see fainter and fainter objects, astronomers have traditionally built larger and larger telescopes to gather more light. But on Earth gravity limits the size of telescopes. 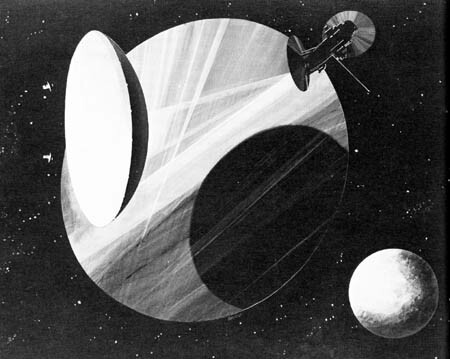 Much larger telescopes can be built for use in space, where gravity presents no problem. The second limit is a limit on the sharpness or detail of an image, what astronomers call resolution. It is of little value to form a bright image of a distant object if that image proves to be blurry, and the atmosphere blurs images. The importance of resolution is illustrated by comparing the bright but blurred images of Mars taken with Earthbound telescopes with the far clearer photos taken at close quarters by spacecraft. The third limit involves the range of wavelengths which can be studied. Until the start of the revolution in astronomy, for all its big telescopes and sensitive photography, astronomy was still as keyed to the human eye as it had been in the time of the Babylonians. The first big advance, outside the range of wavelengths accessible to the eye, came when Ryle in England and Mills in Australia began to build radio telescopes. Today, radio astronomy is fully on a par with optical astronomy in terms of the sophistication of its instruments and the number of talented people it has attracted. More recently, advances in infrared sensors led Gerry Neugebauer of Caltech to set up the first major infrared observatory; and satellites and spacecraft have begun to give astronomers tantalizing glimpses of the X-ray sky, the gamma-ray sky, and the far ultraviolet. However, at radio wavelengths, man-made interference can be a serious problem. Radio astronomers have a saying that when they see anything interesting ninety-nine times out of a hundred it turns out to be someone’s electric shaver or auto ignition. Also, Earth’s atmosphere will continue to block out or absorb many of the most interesting wavelengths. All these problems can be overcome in space. What is needed is a permanently staffed observatory in space, supported by a community which will fully recognize its value. 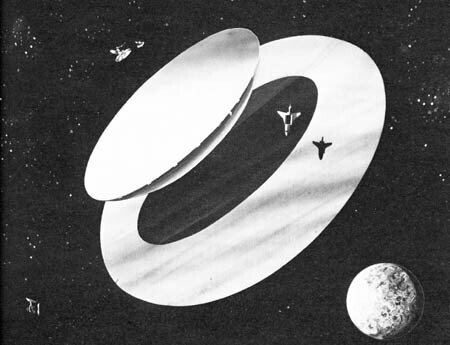 The space colony will be such a community, and the University of Space will have such an observatory. At the colony the same control over material properties which will yield new alloys also will permit the casting of optical blanks for telescope mirrors of unprecedented size. These may be used with image tubes, which amplify faint light so that an exposure which formerly would have taken hours now can be done in a few minutes. The resulting telescopes will not only excel in viewing faint objects but also provide fantastic resolutions. In seeking larger telescopes one useful technique will be the “rubber mirror.” This is an array of small mirrors, adjustable in position to give the performance of a single large one. Radio interferometry at extreme resolution will be put on a permanent routine basis. 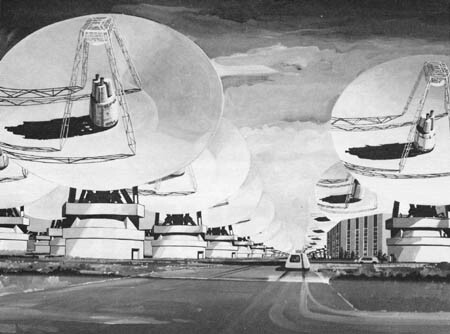 Standard radio telescopes will be simple light affairs, perhaps resembling giant umbrellas rather than requiring the massive trussworks and supports of their Earth-based cousins. There may be many such instruments, widely separated in the space near the colony, yet always within sight of each other and of the colony—a situation which makes it much easier to do the interferometry. They can be shielded with wire mesh against stray signals from Earth or the moon. 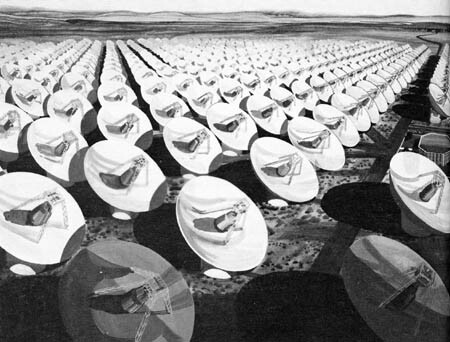 Other radio telescopes will be built, miles in extent, to detect the faintest signals from the most distant sources. The X-ray and ultraviolet astronomers will especially benefit. No longer will they need to wait patiently for the few opportunities each decade. Instead, they will simply set up a workshop in an odd laboratory of the university and proceed to build instruments to their desires. As with the optical shops at Pasadena and Palomar, such a lab will give flexibility and convenience to their work. Few branches of astronomy will fail to benefit from these advances. Much of the Milky Way galaxy lies hidden behind dark nebulae such as the Coal Sack; this includes the interesting regions near the center. Yet radio and infrared waves readily penetrate these clouds. Thus we may become as familiar with the Milky Way as we are with the solar system. We will penetrate with high resolution into the heart of the Orion nebula, where stars are being formed, to learn the details of their origin. The most distant galaxies and quasars may be mapped and studied as if they were a thousand times closer. In the vast drowned depths of space and time, newly accessible to our instruments, we will see directly the effects of the curvature of space. But when we look outward 20 billion light years in space, we are also looking at events which occurred 20 billion years ago in time; and so we may look backward to the very morning of the day of creation. Closer to home, there will be a great flowering of the planetary sciences. The high resolution and breadth of observable spectrum will permit spaceborne telescopes to do much of the work now assigned to spacecraft in studying the planets and small bodies of the solar system. Even in an era of space colonization, planetary missions will continue not only to be costly but also to take years to reach their targets. Besides, there are such a large number of interesting objects that it will take a long time to visit them all. Some, like comets and the most distant planets, may not be visited for many years. With the best spaceborne telescopes it will be a matter of routine to see objects two or three miles across on Mars or features of that size in the atmosphere of Venus. Jupiter and its satellites will be studied at a resolution of a few tens of miles, while hundreds of asteroids and comets may be mapped at least as accurately as were the Martian satellites, Phobos and Deimos, through the photography of Mariner 9. The roiling storms of Jupiter will be seen as clearly, and as routinely, as the hurricanes of Earth. Even distant Pluto and the satellites of Uranus and Neptune will be mapped with better precision than was Mars prior to that same Mariner 9. A particularly important activity will be the detailed study of the sun. The solar astronomers will be concerned with developing a science of solar meteorology, to predict the solar storms which will put spaceships and unshielded quarters at hazard. (Indeed, this activity will be one of the major reasons why the colony will support its astronomers.) But beyond this, there will be efforts to understand and predict slow changes in the sun’s behavior which can influence the climate of Earth. A single well-founded prediction—”The mean global temperature in the next ten years will be 0.3 degree lower than in the last ten years”—will have such implications for Earth’s agriculture as to be worth the cost of 100 major space observatories. But all these activities will be extensions of work already under way in astronomy. The most significant findings may come from studies such as we cannot now undertake but which will become possible at the colony’s observatory. The detection of extrasolar planets may be among the easiest prizes. Even with the highest resolutions, it will be difficult to detect a planet as large as Jupiter against the glare of its nearby star—much less to detect a planet like Earth. But there is a method which will work. Stars do not stay accurately fixed at the same point of the sky, but move slowly in relation to more distant stars with what is called their “proper motion.” If a star has an unseen companion in orbit about it, the star will be seen to move from side to side along its track. Its motion will exhibit wiggles or, as astronomers call them, “perturbations.” From a study of these perturbations, it is possible to determine the mass and orbit of the companion. The difficulty is that detecting extrasolar planets is a task at the limit of today’s capabilities in astronomy. Today’s, yes—but not tomorrow’s. In the colony, all stars out to several dozen light-years will be routinely tracked and studied for evidence of perturbations. Other methods as well will be used, like sending a small guided sphere thousands of miles out, to block the light of a star. In such an artificial eclipse the dim light of a planet will be more easily seen. The single most exciting quest, however, will be for intelligent life in the universe. This search, even today, has attracted enough interest to be granted a four-letter acronym for the use of the bureaucracy—SETI, Search for Extra Terrestrial Intelligence. It has an in-group meaning, too, for it brings to mind the star Tau Ceti, twelve light-years away and very much like the sun, hence possibly the center of a planetary system containing life. NASA has seriously considered making SETI one of its major research themes for the years to come. And it appears likely that long before the first space colony is up there, there will be serious ongoing work devoted to SETI. The colony then will serve to extend this work. SETI people nowadays are most interested in the “Cyclops” system, proposed by Bernard Oliver of Hewlett-Packard, as a means to carry forward the search. 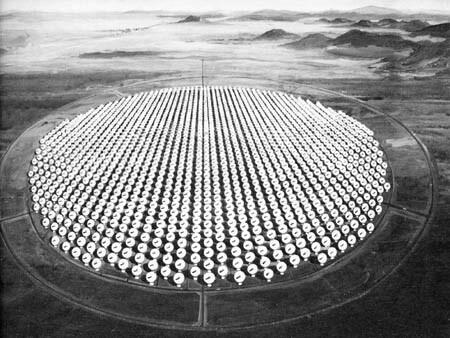 Most of the attention given to Cyclops has focused on Oliver’s proposal to build an immense array of radio telescopes, miles in extent, for the search. (This was the emphasis in Arthur Clarke’s Imperial Earth.) But the heart of Cyclops is nothing so dramatic. It is a means for rapidly and accurately scanning an entire broad region of the radio spectrum with high sensitivity to detect a weak drifting signal amid the cosmic noise. This technique involves an optical spectrum analyzer, which simultaneously receives signals on up to a billion distinct wavelengths and records the signals on photographic film. By searching through narrow bands at neighboring frequencies, Cyclops will detect a signal a billion times weaker than the surrounding noise in which that signal is buried. But at what frequencies shall we search? Here too, Oliver has a recommendation. At the lowest frequencies, in the hundreds of megahertz, there is strong interference due to radio noise from the galaxy itself. At frequencies of a few gigahertz (billions of cycles per second), the background noise from the Big Bang, from the universe itself, begins to pick up. At slightly higher frequencies radio signals are absorbed by water vapor in the atmosphere. So the best part of the spectrum turns out to be from about 1 to 2 gigahertz. The galactic heritage could include a large body of science that we have yet to discover. It would include such things as pictures of the Galaxy taken several billion years ago; it would include the natural histories of all the myriads of life forms that must exist in the planets of their member races. We could see the unimaginable diverse kinds of life that evolution has produced in other worlds and learn their biochemistries, their varieties of sense organs, and their psychologies. Culturally, we might learn new art forms and aesthetic endeavors. But more significant will be the societal benefits. We will be in touch with races that have achieved longevity. The galactic community would already have distilled out of its member cultures the political systems, the social forms, and the morality most conducive to survival, not for just a few generations, but for billions of years. We might learn how other races solved their pollution problems, their ecological problems, and how they have shouldered the responsibility for genetic evolution in a compassionate society.